Why is the bread basket of Arabia importing more water via grain than is pumped locally by all sectors and why does nobody notice? How can the same water be sold to different users at prices varying by five orders of magnitude? How can the biggest names in development throw millions of dollars at supplying water to a city and not an extra drop has emerged? Why do some of the wealthiest companies in the Middle East and their multinational associates get away with polluting water resources? 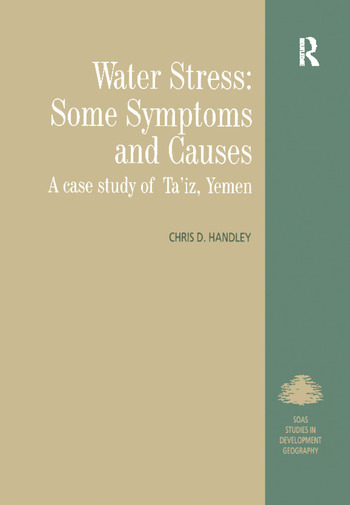 This book presents the complex and fascinating account of Ta'iz, Yemen, a city embroiled in severe water stress as a consequence of environmental degradation, political facades, conflicting legal systems, military intervention and institutional incompetence. The result is a remarkable, compelling and controversial book which will be essential reading for academics, development agencies and NGOs around the world. Contents: Introduction; Autopsy of an aquifer; A socio-economic map of water allocation and use; Discussion: anatomy of a water crisis; Conclusions; Photographs; Bibliography; Index.